In 1963 the Li 150 Special was introduced with several new features. Intended as a sportier version to the standard Li, but a cheaper alternative to the TV, the Special was given different styling, by the way of the newly revised Series 3 T.V panel work, including an octagonal headset, front mudguard, horn cast, and side panels. The side panels featured front and rear finger flashes, and two Lambretta badges. A dual seat was offered as standard, but the single seats from the Li were available as an option on certain markets. Engine wise the 150 had a change of barrel and head, but strangely not the carburettor of 18mm, giving it a power boost to 8.25bhp compared to the 6.6bhp of the standard L.i. Gearbox was also reworked, to make use of the rise in power, with new closer ratios, which was and remains a favorite with scooter racers. These gearboxes were not without problems though as the third gear was thinner the normal, which caused them to break, so innocenti subsequently changed it for a thicker one on later models, with slightly different ratios. In the UK the Li 150 Special was marketed as the Pacemaker, a Pacemaker sticker was affixed directly under the Special badge on the front leg shields. Concessionaires the pop group Gerry and the Pacemakers in a whole host of promotional material. A 125cc version was introduced in October 1965, (mainly because of tax advantages in Italy) and if anything was a more highly tuned version than the 150. Fitted with a 20mm carburettor, with again changes in barrel and piston similar to the 150, and also an increase in compression ratio, saw the 125 give a power output of 7.12bhp and a top speed of around 50 mph. Where the 125 version rated better then its 150cc brother was in acceleration due to low gear ratios used on this model. This gearbox went on and found its way in to the later sportier GP 125 and GP200 models. Despite its sporty looks, very few were imported into the UK at the time, as the UK markets desire was in larger capacity machines, how ever in recent years large numbers have come over from Italy with dealers or private individuals realising the benefits of this machine. Two models were introduced in 1965 by Innocenti, possibly either to help sales, or with the launch of the smaller 125 models. The silver special, which wasn't very impressive because they were silver anyway, and the golden special, which was completely including wheels hubs and forks etc, painted in a pale gold colour. 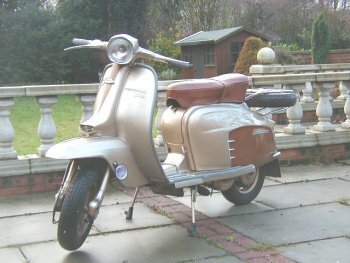 Both models gained a rear frame badge with the wording special, with either golden or silver dependant on the colour of scooter, while on the front a chromed silver or golden badge was fitted on the right hand leg shield. The Golden model did gain a brown vinyl seat. By the time production stopped in October 1966, a very respectable 69,529 150 Specials and 29,841 125's had been produced. With colours options of white or metallic blue for the 125's, the 150s were available in Silver or Gold from the factory, but as with other models Lambretta concessionaires offered a wider choice, these being green on white, with panel colours of red or blue.